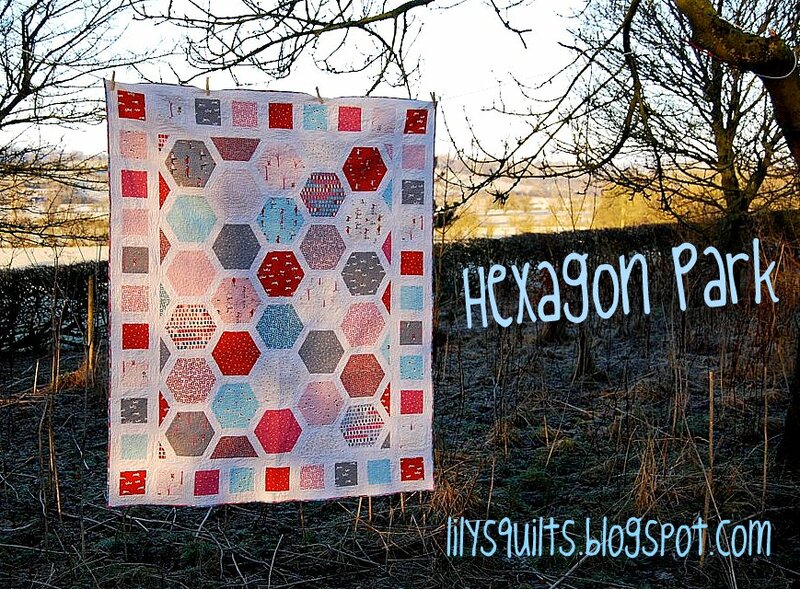 Well many moons ago, I designed a BIG HEXAGON quilt for Moda Bake Shop called Hexagon Park, made it in Sherbert Pips, quilted it in all kinds of crazy FMQ and loved it with all my heart. Loved it so much in fact that, when it came to choosing a quilt to donate to Siblings Together, I felt this was the right one to choose. Little girl prints, dogs running in the park, kids on scooters and swings. And I wanted to give it away to some child separated from their siblings BECAUSE I love this quilt so much. Because I think you give the best things you can, made from your favourite fabrics, that you love the most, as you would for your own children. But I confess I have really been missing Hexagon Park. Silly I know and I don't regret it ONE BIT but I do miss it. Because it was a very special quilt for me. And I hope it will be a very special quilt for some little girl. And then yesterday Trudi came and visited and brought her Arcadia Hexagon Park for "show and tell" and I confess I very cheekily asked if I could have it and she very generously said "yes, of course". Arcadia is one of my all time favourite lines ever. And take a closer look, Trudi's piecing is better than mine and her quilting is WAAAAAAY better than mine and this quilt is absolutely beautiful. Thank you so much Trudi, I love this quilt so much and it will be mine all mine and will not be shared with my children or husband - ouch, now I'm now sounding as nice I was sounding at the start of this post. see? another quilt that was just waiting for the right owner! What a lovely gift - yours and Trudy's. I can see why this quilt is/was/is your favorite! What a neat pattern and lovely fabrics! I love Arcadia too - it is the first quilting fabric I ever had and I made a quilt for my son from it, which I love but is not as nice as Trudi`s! Enjoy your new quilt...what goes around, comes around. Oh wow you lucky girl! That is a stunner. Also how kind of you to give away the Sherbet Pips one. Paying it forward is a lovely trait. It's quilt karma. Trudi has given you such a beautiful quilt - and you designed it! Woot! I think I'd pee my pants and blub if someone gave me a grown up quilt like that - none of my friends is remotely stitchy. 100% agree about giving quilts from our bestest most fave fabrics - I think of us fabric foster parents - we get to stroke and love our stash all through the process and then we have the sweet pain of letting them go to new homes! It is utterly gorgeous! She's very talented and you created a fabulous pattern :) I loved making mine and gifting it to a special baby girl. Glad you've got such a stunning one of your own, Trudi is awesome! This is just a heart-warming post all the way around. How very sad for a child to be apart from his/her siblings. I love that you gave a quilt you love so very much just like you would if it was for your own kids. Sometimes the quilts I've seen made and given to groups such as Project Linus don't look like anything that someone would really care about giving away and I believe that fact is not lost on the recipient. I know your quilt will warm the heart of a little girl. And, Wow! Trudi really blessed you ;o) What a sweet spirit she has! ps what does redux mean? Both quilts are beautiful and I wouldn't want to share Trudi's quilt either. Both are fab, and love the quilting on Trudi's, she does such amazing FMQ work! How sweet of Trudi to give it to you! Beautiful quilt! Well time for quick verse of 'The Circle of Life'!! That is a very beautiful quilt....even more so because a friend made it. Wow, I need to start being nicer to trudi! Trudi is such a gem...as are you! Quilt Karma indeed! You never know when a random act of kindness will strike ... or indeed feel 'just right' ! Seriously? You just asked for it and she gave it to you? What do you put in the tea you serve at the KG, anyway? Another example of the saying I've always believed in, " What you do comes back to you." Wow, what a talented and generous friend you have! The only thing my friends know how to do is mix drinks, so I may have to trade them in! ;). Congrats on your beautiful gift. You are cheeky, we all knew that! Trudi's quilting is awesome! Lucky, lucky you! I have some "Walk in the Woods" layer cakes, and this is my choice for those fabrics. Pink & grey, who knew? You did a fantastic job! Thank you. Wow - when two favorite's collide... Your Hexagon Park is one of my favorite MBS tutorials of all time and is still on my to-do list. Then here comes one made out of one of my favorite fabric collections of all time (I LUV Arcadia!) and it is a match made in heaven. I'm so glad you shared this. I still have a Honey Bun and some odd bits of Arcadia squirrled away. I really should let them see the light of day. Thanks for the motivation!! That is a beautiful quilt :-) Trudi's quilting is lovely!